The changing form-factor of SSD drives is making quick and easy MacBook Pro and Air upgrades more challenging. As Apple has shifted from 2.5" SATA drives to micro-SATA SSD modules, now to PCIe-SSD modules/blades, the choices in solid-state drive upgrade options is being severely limited. For many older MacBook laptops, off-the-shelf low-profile 7mm and 9mm 2.5 inch drives have become very cheap and are easy to install. A reasonably easy SSD drive swap: The Classic white Apple Intel MacBook has 3 screws in the battery compartment to access the MacBook's "L" shaped metal strip that covers the memory slot. Remove it and you'll see the plastic tab that allows you to pull out the SATA I or II speed hard drive. 4 Torx screws on the standard drive mount holes remove the thin 'tray' that holds the 2.5" SATA drive. Put tray that onto your new SATA SSD and slide it back in. Replace the "L"-shaped memory cover, then the battery. That easy. 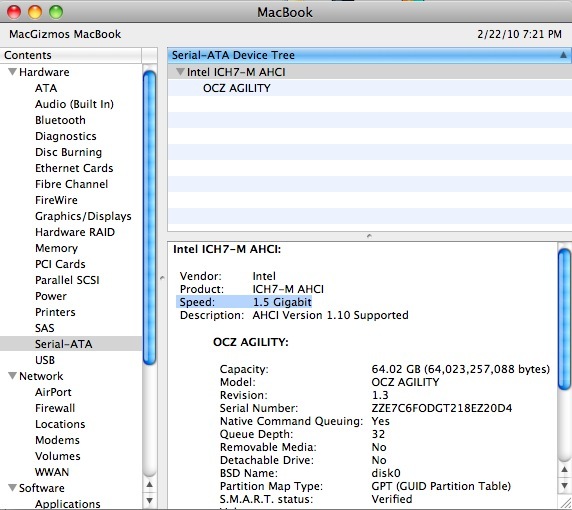 Note: The White 'consumer' MacBooks all used a SATA I speed 1.5 Gigabit controller chip until early 2009. It wasn't until the first Unibody Aluminum models (and revised late 2009 models of the White MacBook) that Apple moved up to a SATA II 3 GBPS speed controller chip. So if your laptop is several generations old, you may not need to buy a really high-performance SSD. 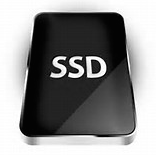 'Value' series SSD's may be a better match for the 'slower' SATA I spec. Use Apple System Profiler to determine if yours is 1.5, 3.0, ot 6 Gigabit. 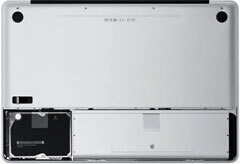 Apple finally got design decisions right to make Unibody MacBook and MacBook PRO SATA hard drives easily replaceable. They're right under the battery compartment cover (and along with Mac Pro towers) - one of the easiest solid-state Mac drive upgrades to perform. You'll want a good Apple toolkit with a set of Torx bit drivers and small Philips screwdriver. In a nutshell: Turn off the notebook, disconnect cables, flip it over and push down the latch to release the access door, discharge static electricity, unscrew the drive retention bracket, disconnect the SATA connector, remove the 4 T-6 screws and install them on the new drive, and reassemble the computer. It's really that easy! Apple made things different with the built-in Li-On battery models in it's Mid 2009 and later MacBook Pros. The entire bottom cover must be removed. Then 2 Phillips screws in the drive's lock bar are removed. Lift the hard drive, remove the SATA II cable, then swap drive mount screws. Verify the rubber grommets are in position for the solid-state drive. Reassemble, noting that some of the bottom cover screws go in at a slight 15 degree angle on the rounded bevel edges. Also note the 3 right-rear screws are 13.5mm long - all others are short 3mm. Both 6Gbps SATA III -- and now PCIe solid-state drive modules have been used in the more recent Retina era MacBook Pro lineup. And once again, Apple has chosen to use slightly non-standard mSATA or PCI SSD connectors. Custom pin configurations and notch-spacing make retail solid-state drive card upgrades a challenge. OWC and Transcend seem to your two main choices to provide compatible modules specific to Mac. In the Windows PC world, many desktop and laptop manufacturers jumped on and complied with widely-adopted industry standard mSATA or PCIe module M.2 connectors and pinouts that allows PC owners to find compatible solid-state drive upgrade cards from companies like Samsung, WD, Crucial, Kingston and others quite easily. Not so in the all too often proprietary world of Apple computing. An Apple compatible SSD for MacBook Pro Aluminum Unibody and 'Classic' White MacBooks is a natural fit for the multitude of 2.5" SATA interface laptop size SSD flash drives that dominate the retail market. Most MacBook laptops are reasonably easy Do-It-Yourself Solid-State drive upgrades. 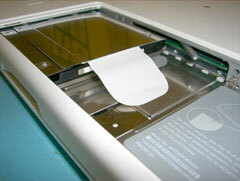 Others, like the very earliest 2008-era Intel MacBook Pros are best left to computer technicians to dissassemble and perform the swap. For basic White MacBooks prior to Late 2008 / Early 2009 models - A midrange SSD is well matched to the older SATA I chipset 150Mbps tansfer rates. For newer PRO-series MacBooks, seek out the CURRENT crop of top-performing SATA III drives based on recently improved controller chipsets and firmware. They'll take full advantage of the 300Mbps max bandwidth of the SATA II (and recently III) chipsets found in the MacBook Pro, the latest White MacBooks and new Mac mini computers of 2009 thru 2012. You'll be SATA III ready to swap the drive into your _next_ Macintosh for even better performance. Having the right tools helps when attempting a Do-It-Yourself Macbook drive upgrades. Apple's been using unusual screw-heads for drive mounts and case dissassembly, so a Mac specific toolkit can help perform a drive swap correctly and quickly.